Tall dark and beautiful meets tall dark and handsome! Brick Chapel Shilohs and High Caliber Shilohs are excited to announce the pairing of NS briCH Brk Chapels Tempted By Delyla, TT, CGC and MBIS GrCH rbsCH High Caliber's Mountain Majesty, TT, CGC, TDI. This pairing will bring together third generation Orbit and foundation lines to produce pups that are 4th gereration Orbit or full Shiloh. 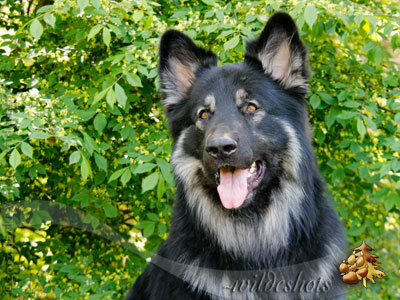 Delyla is a striking dark brown sable with great height and bone. She has a fun-loving personality and has always been a fast learner, earning her Canine Good Citizen award at 5 months of age. 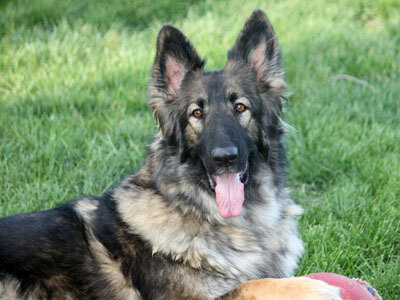 Delyla enjoys agility, herding, and off leash obedience. She is an extremely sweet, talkative girl who likes to give hugs and kisses to all her humans. She is my constant companion and my best friend. In addition to earning her CGC Delyla has passed her adult temperament test and has earned several champion titles as well as a National Select with the TSSR. Colby is High Caliber's pride and joy, embodying all that a Shiloh should be. He has nice structure and proportions, a beautiful long and full tail and an absolutely fabulous head. He loves to play ball and go for rides in ATVs :-) To top it all off, Colby has the sweetest temperament, being a happy and playful boy, yet ready to protect his family should the need arise. He has beautiful, effortless movement that has earned him a multitude of conformation show awards, including two National Selects, championships with his registry and breed club, and a Supreme Grand Championship with the International Canine Kennel Club. He has also attained certifications for adult Temperament Testing, Canine Good Citizen, and Therapy Dogs International. We expect the Delyla & Colby pairing to produce some wonderful pups both in conformation and temperament. Height and bone should be outstanding. Nice heads and great pigment will also be prominent in the litter. This litter would be a good place to look for a therapy or assistance prospect. Puppies will be plush coated sables with a variety of colors possible.